Some of the keyboards I have tested here on TechPowerUp definitely belong to the high-end market. Such keyboards tend to be quite nice, but are also priced higher than most of our readers could really justify easily. One of the things I want to do by covering keyboards here, among other things, is to draw attention to items most media tend to ignore. I was in fact surprised Genius already even had an entry in the TechPowerUp company database (albeit because of CES coverage from a decade ago). When their marketing representative contacted me about doing a review, I had to look them up, and I liked what I saw. Hopefully, you will too as we begin our review of the SlimStar 8008 combo, and thanks again to them for providing a review sample. I was in two minds about whether to place this in the keyboards or couch-gaming category given this is a combo kit that comes with a keyboard and mouse. However, I defer to Ino for his excellent mice reviews here and, given they are separate units that make more sense on a desk regardless, I will be covering the keyboard in more detail to only use the mouse as appropriate. 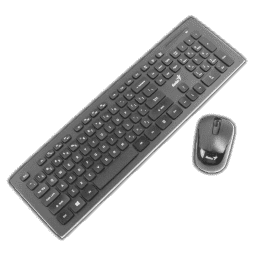 The image above does a good job of telling you that the keyboard is low in profile, and the specifications below confirm the use of membrane switches and flat, chiclet-style keycaps. 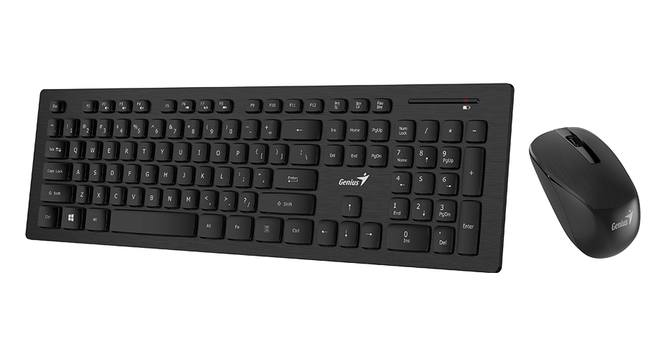 However, Genius claims this is a smart keyboard, and there is more to that we will explore further.